Lessons learned from experiences have a way of carrying tremendous value in shaping the lives of those who allow those moments to be impactful. After a recent conversation with uncommitted 2021 Dirtbag Drew Tyndall of Ashley High School, it is obvious that he allows his experiences to guide and shape his life. What is also obvious, is that he is keen to observing the experiences of others. Thus, after learning that his family routinely served as a host family for college baseball players during some very formative years it makes sense that Drew would want to pursue the same path. Over several summers he guessed they had as many as 5 players Wilmington Sharks of the highly touted Coastal Plain League as house guests. The sophomore utility player has been able to make those experiences count, as he has developed some very refined skills across a variety of positions on the field. The connection of his skills to these past experiences is quite obvious to Dirtbags Player Development Director Brent Haynes, who says, “ He’s a guy you can literally plug in anywhere on the field and you know he is going to do a great job.” Despite being able to play “anywhere” for his high school team, Drew sees himself as a catcher/infielder collegiately. His favorite is catching. But what he really loves to do is hit – from either side of the plate. That’s right, Mr. Tyndall is a switch hitting catcher. The story to how Tyndall began the move to switch hitting speaks volumes to his experiences and how he allows people with positive influence become impactful on his life. It was the summer of 2011 when a player from the Sharks was living with his family. Drew remembers one night player got pulled from a game prior to an at-bat due to the manager attempting to get a matchup. The player was a left-handed hitter and advised the eight year old to go ahead and learn to hit from both sides of the plate so that would never happen to him. Tyndall took him up on it and began the journey to being a switch hitter. While the transition assuredly had some struggles early, he was recently asked by some evaluators at a recent BP round what was his dominant side of the plate. They couldn’t tell. Drew credits his high school skipper, Brian Stewart greatly for his most recent strides in the skill. Though a natural righty, the hope is that he can operate from either side without hesitation this spring to create matchup advantages. 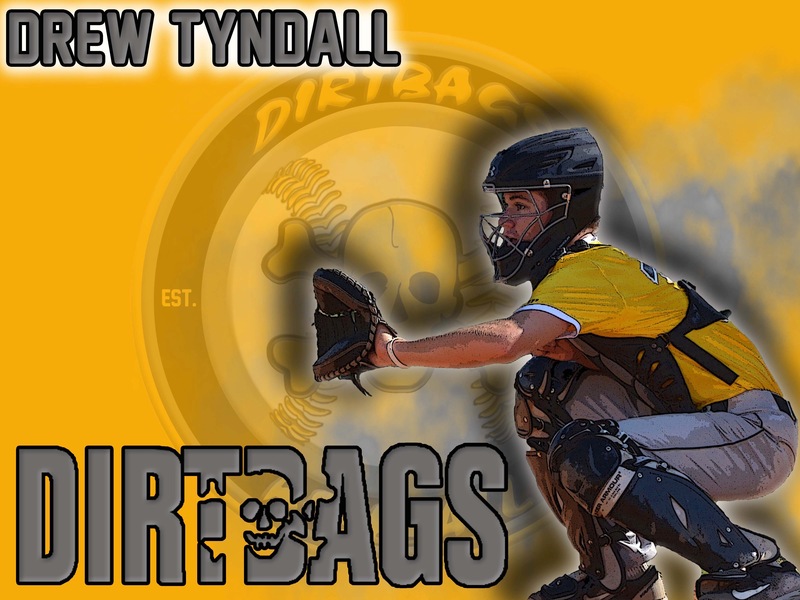 Playing for the Dirtbags since attending a tryout prior to the fall of 2017, Tyndall has plenty of experiences to serve as resources for his continued development. Recalling a game in the summer 2018 vs. Team Elite, Drew tells of a situation where he was playing catcher and blocked ball with runners at first and third. With the runner at first breaking for second, the heady catcher recovered the ball and decoyed a throw to second base. This prompted the runner at third base to over extend and the clever catcher was able to throw behind him which led to a rundown resulting in an out. With plays like that and the productive switch hitting swing, it’s no wonder the search for that perfect college fit has begun. As the the recruiting process heats up, look for Drew to connect with those programs that can offer experiences in a variety of areas. From a staff that will push and mold him to continue to develop, to facilities that offer him opportunities to be enhanced and play on stages vs. top competition. Also expect the sophomore to consider factors beyond the field for decisions so important. In fact, when asked about what his favorite class in school might be to this point, he raved about his experiences in an honors service course where he works with students with disabilities in activities and sports. Experiences he counts as powerful for him and assuredly meaningful for those he serves. That’s value that extends both ways.